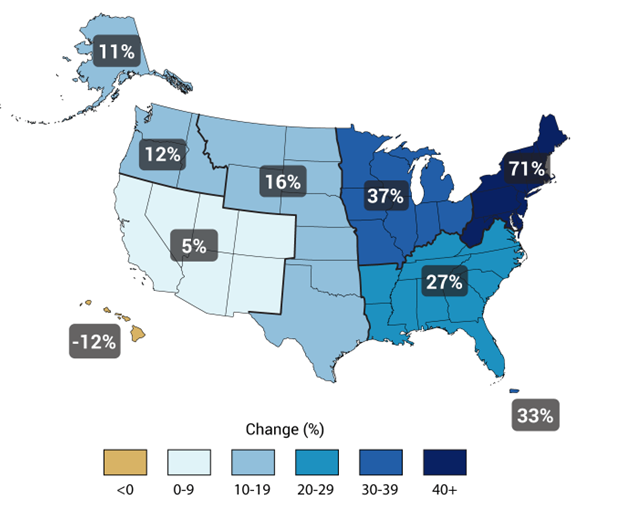 Figure 1: This map shows percent increases in the amount of precipitation falling in very heavy events (defined as the heaviest 1% of all daily events) from 1958 to 2012 for each region of the continental United States. 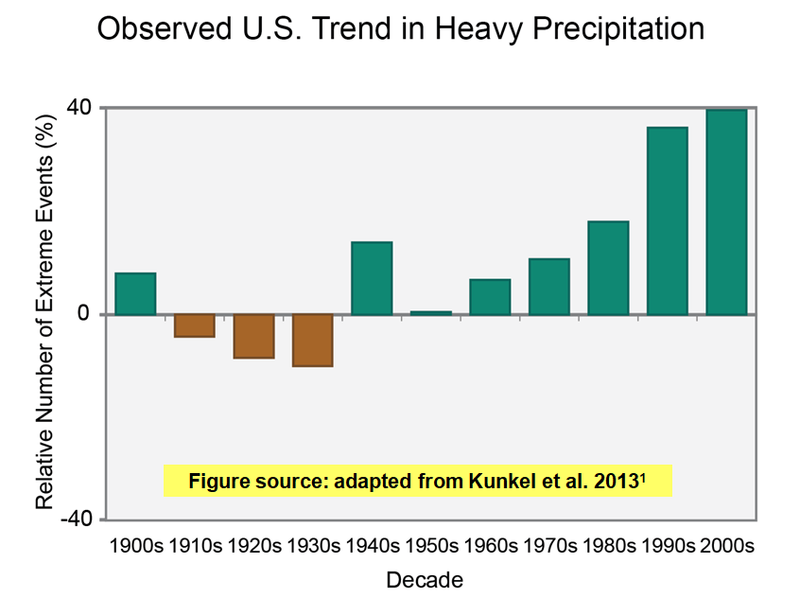 Figure 2: Percent change in the annual amount of precipitation falling in very heavy events, defined as the heaviest 1% of all daily events from 1901 to 2012 for each region, from the 2014 National Climate Assessment. As seen below, the increases in precipitation are real, but they have to do with recent improvements in precipitation observation technology which are related to corrections to an old problem, that is, the difficulties that have long existed in trying to observe rain and snow while winds, especially stronger winds, are blowing. 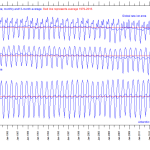 The most common types of precipitation, rain, snow, rain showers and thundershowers are susceptible to significant measurement errors, especially, as mentioned above, as the wind, which often accompanies these types of events, increases. The higher the wind speed, the more difficult it has been to get an accurate measurement. Sometimes even the occurrence of blowing snow when it is not snowing interferes with getting a good snowfall measurement. 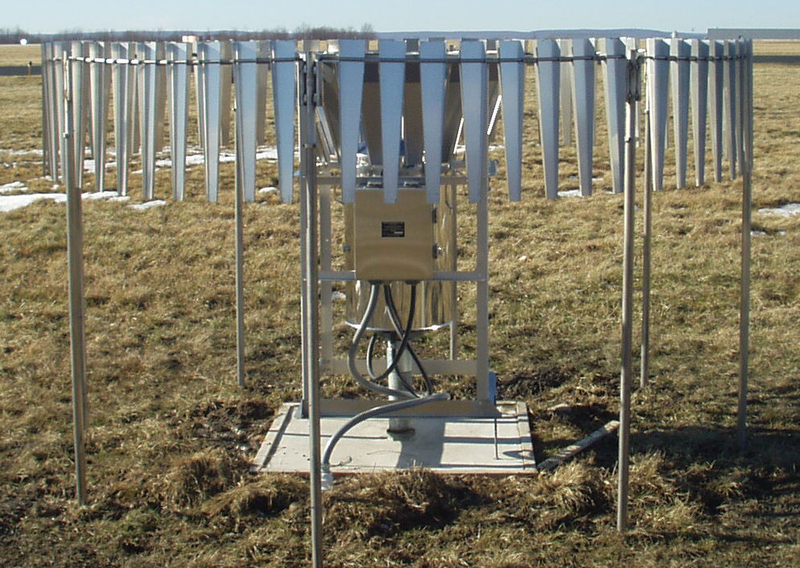 Wind and wind-induced turbulence around the orifice of instruments such as rain gages is a common problem with precipitation measurements. This wind effect has been known for over 100 years. And, since wind increases with height in the atmosphere, instruments sited a good distance above ground are more problematic, but instruments close to the ground might be buried in heavy snow and snow which has drifted, especially if the instrument is close to a building where lee side effects might make the problem even worse. Figure 3. Comparative winter precipitation catch efficiency in experimental U. S. Weather Bureau standard gages at Priest River Experimental Forest, Idaho. 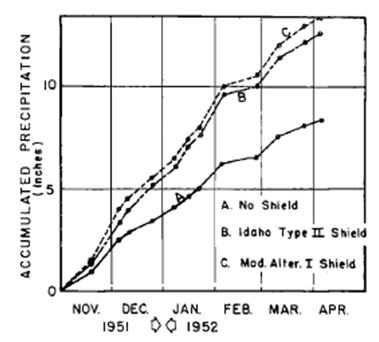 This Forest Service report shows the problem of undercatchment of precipitation during the snow season at the Priest River Experimental Forest, Idaho, during winter 1951- 1952. A, unshielded 8-inch gage, B, Sacramento Storage Gage with Alter-1 windshield, and C, Standpipe storage gage with Idaho Type 1 windshield. As we used to say when I was assigned to the US Army’s VII Corps during the Cold War, “Weather is a National Responsibility,” and the different nations have developed different precipitation-measuring instruments and methodologies in response to this responsibility. 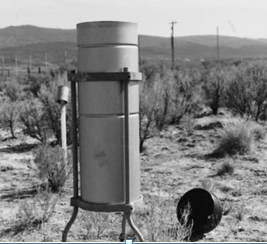 The World Meteorological Organization, a technical arm of the United Nations, has developed intercomparison methodologies and campaigns to cope with the different instrument types and methodologies to help account for the difficulties in precipitation measurements, especially in light of the problems which occur when wind accompanies precipitation. Numerous studies have shown the value of shielded gages, and during the WMO intercomparisons a “gold standard” to determine “ground truth” was developed; it’s called the DFIR, short for Dual Fence Intercomparison Reference. 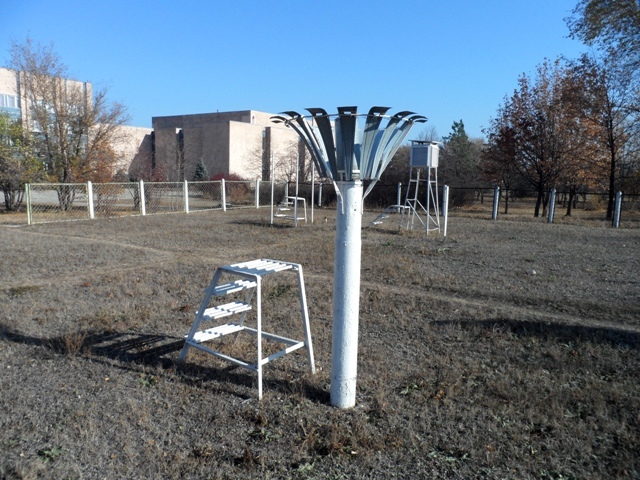 The DFIR has two external fences reminiscent of the snow fences in snowy areas of the US, but placed on poles. Below is an image of a DFIR that I found for sale in Almaty, Kazakhstan. Figure 5: Dual Fence Intercomparison Reference, or DFIR, showing the dual fences suspended on poles with the top of the outer fences 3.5 meters or about 11 ft above ground. The top of the inner fence is 3 meters or a little less than 10 ft above ground . The lath elements of the fence are 1.5 meters long, and the lath covers 50% of the area of the fence. The outer fence is 12 meters or 39.4 ft in diameter with the top of the lath “fence” at 3.5 meters or 11 ½ ft above ground. The inner fence is 4 meters or a little over 13 ft in diameter, with the top of this inner lath “fence” at 3.5 meters or 11 ½ ft above ground. The gage itself is in the center of this array and is itself frequently equipped with another windshield. stated that in the USA, we are undercounting precipitation especially when it is windy and snowy; the problems are compounded in the mountain West. 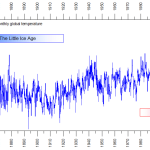 Introduction of wind shields in the 1940s to some, but not all gages presents a discontinuity, and the studies of “climate change” that do not take these into account are likely to be misleading. For snow events, they found that of the snow which occurred and was captured in the DFIR, a full 57% was NOT caught in the Standard 8-inch rain and snow gage. Considering Rain, Mixed Rain and Snow, and Snow 67.4% was caught, meaning that almost one-third, or 32.6%, was not caught. 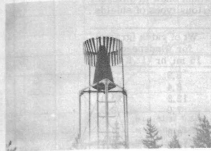 This was an example of the state of the extant measurement practice as the modernization of the NWS surface reporting networks was taking place in the early 1990s. 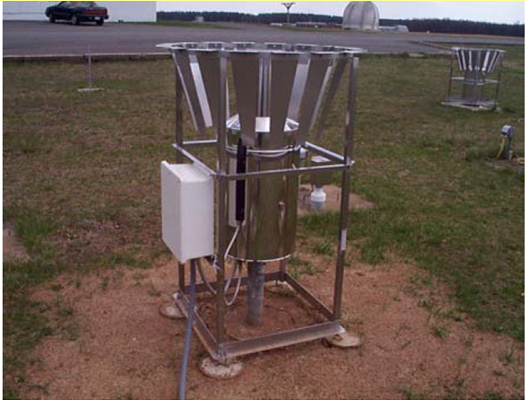 With the development of the Automated Surface Observation System or ASOS in the 1990s, the National Weather Service developed and fielded a Frise heated tipping bucket rain gage which replaced most of the 8-inch gages which were the previous standard, and which was shown above in figure 4A. The Frise gage was closer to the ground and shielded with a variety of an Alter rain shield. 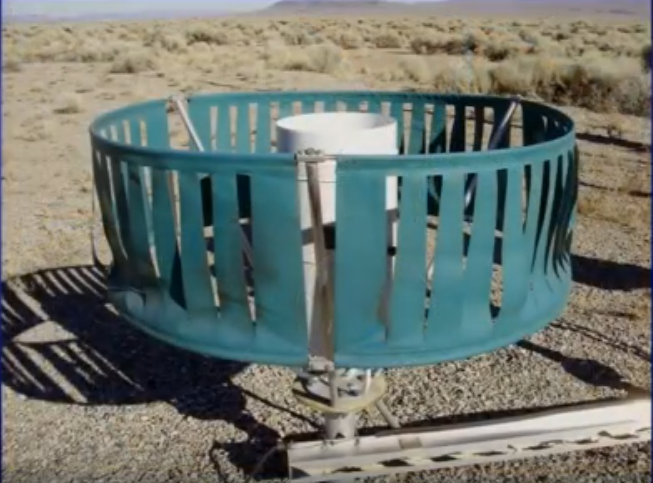 Figure 8: The Frise heated tipping bucket gage shielded with a modified Alter wind shield was fielded with the Automated Surface Observation System, ASOS. Closer to the ground, heated to avoid freezing rain and wet snow difficulties, and automated to provide near real-time data, it avoided many problems with the Standard 8-inch gage of previous years. Figure 9. The Ott weighing gage with integral Tretyakov shield. NWS calls this the All-Weather Precipitation Accumulation Gage, or AWPAG. Final configuration: According to the NWS, the final configuration of the precipitation measuring subsystem of the ASOS is an Ott AWPAG with integral Tretyakov shield and an additional 8-foot Alter shield. Although not as unwieldy in terms of size and area required as the DFIR, the final configuration, shown below shows great promise in the ability to capture most rain and snow events and report them via the ASOS system in near real time. 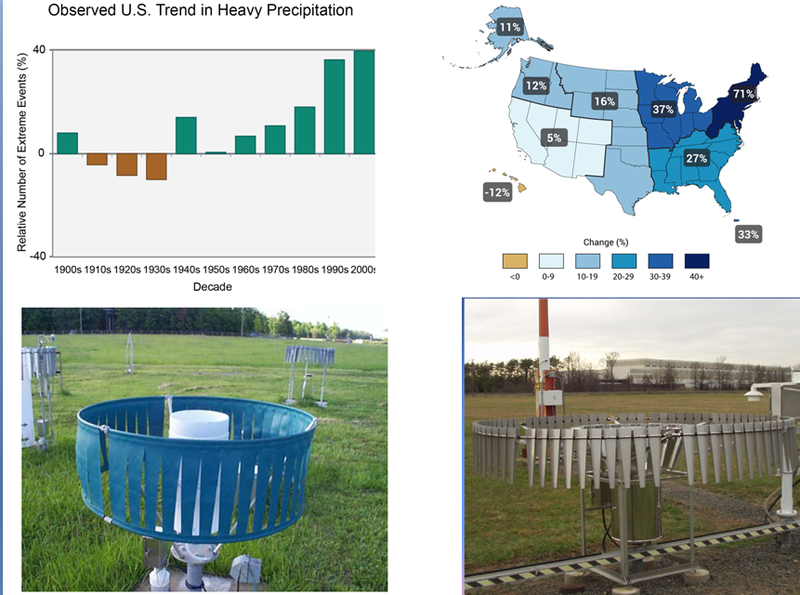 David Legates results: During the first session of the 9 November 2017 climate and energy conference in Houston, Dr David Legates, University of Delaware, showed the dramatic increase in increase in the extreme 1-day precipitation events in the USA corresponds directly with the fielding of the NWS automated systems having shielded automatic recording rain gages. https://www.youtube.com/watch?v=yB6cbwVTWs4 The most important part for this discussion is from 1:54:20- 2:06:20. Dr Legates shows that up to 1992 there is no trend in extreme 1-day precipitation events, and from 1995-2016 there is also no trend. 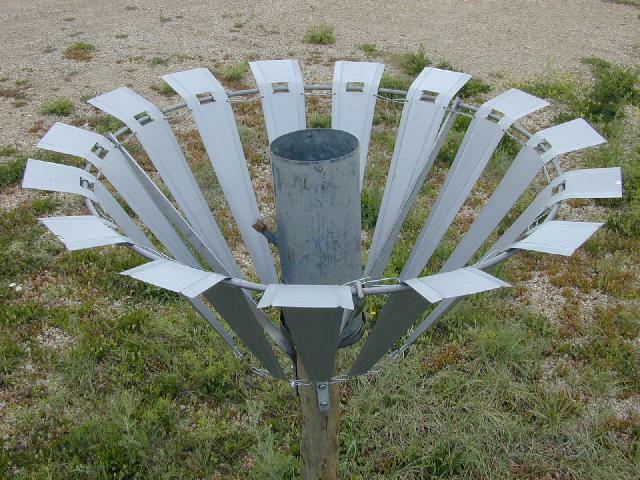 The change came about from the early 1990s NWS modernization with the automation of precipitation measurement with the shielded Frise tipping bucket rain gage followed by the dual shielded gage having an external 8-foot Alter-style wind shield and integral Tretyakov shield for the Ott All Weather Precipitation Accumulation Gage, AWPAG. So that while alarmists and their organizations want to show a hockey-stick type curve related to increasing atmospheric <CO2>, in reality this is simply a response to the better precipitation measurement methodology which has been implemented as part of the NWS modernization program for surface observations which has reduced the wind-induced precipitation measurement losses. 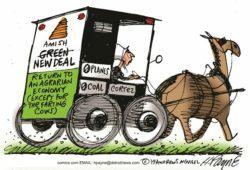 This is another alarmist claim demolished by facts, and brought to my attention by Dr David Legates’ presentation at the America First Energy Conference on 9 November 2017 in Houston. Figure 11: The apparently dramatic increases in precipitation that are shown in the top portion of this figure are the result of the shielded rain and snow gages that were installed by the National Weather Service during the modernizations begun in the 1990s. Conclusion: We now know that these precipitation increases are real, but they are artifacts of improved collection of precipitation with dual-shielded ASOS gages, not because of human-caused CO2-fueled changed weather or climate. Robert W. Endlich served as Weather Officer in the USAF for 21 Years. From 1984-1993 he provided toxic corridor and laser propagation support to the High Energy Laser Systems Test Facility at White Sands Missile Range. He has published in the technical literature and worked as software test engineer at New Mexico State University. He was elected to Chi Epsilon Pi, the national Meteorology Honor Society, while an Air Force Basic Meteorology student at Texas A&M University. He has a bachelor’s degree in Geology from Rutgers University and a master’s in Meteorology from the Pennsylvania State University.